We are just back from West New York, visiting with our daughter, son-in-law and grand-puppy. Fabulous trip, lots of shopping ladies...new hat, No. 44 coming up shortly! 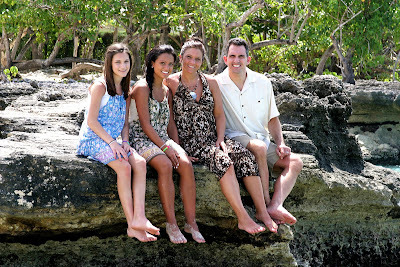 Here is a wedding I did on 1 April for a lovely family from Aurora, Illinois, traveling on Carnival cruise lines. It was important to this couple that the bride's two teenaged daughters were included in the ceremony. I wrote a special part into the ceremony for the groom to say. He also gave each girl a small silver ring as a memento of the day. 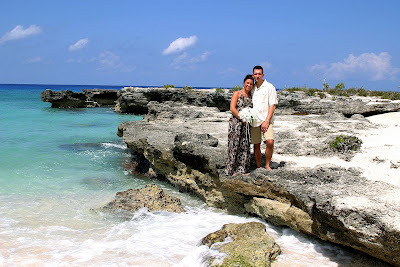 Here we are at My Secret Cove, which was the perfect spot for an intimate family wedding. 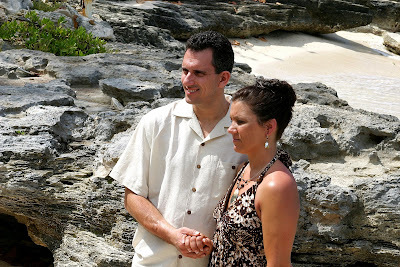 There is a natural step in the rock here, which creates a little staging area for the couple to stand on. This lovely bouquet of silk lilies was created by the bride, who brought them with her. As predicted. the girls enjoyed the natural beauty of this special spot. They even found a local pirate, who was happy to pose with them. This shot was taken at Smith's Cove, it's one of my favourite scenes because the white sand on the rocks looks like snow. 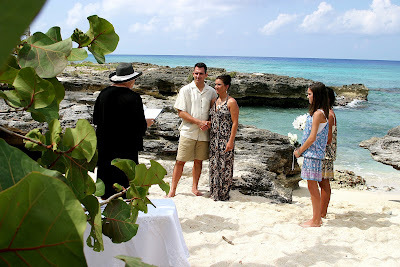 Call me at (345)5256551 or (345)9269933 for an application form for your Cayman Cruise Beach Wedding today. I am a member of the Association for Wedding Professionals International and work to their Code of Ethics. Refund, and bad weather policies in effect. 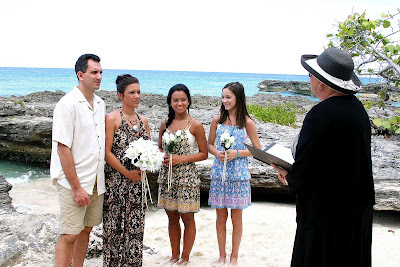 I officiate at only one cruise wedding per day, so I can give you my full attention. A wedding planner present at each ceremony, you can relax and enjoy your special day. This wedding, ceremony by Joy for Simply Weddings, photography by Mari of Island Photos.